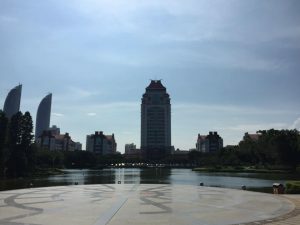 When I returned to Cardiff after my last visit to Xiamen in February, I never thought I would be going back soon. 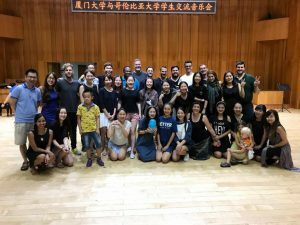 I am incredibly grateful for this fantastic opportunity to have returned to Xiamen to take part in the University of Columbia’s Teachers College course. My journey started at London Heathrow airport on 17th June. I flew Air China to Beijing and then on to Xiamen Gaoqi airport. I was greeted by a student of the Art College and a friend I had made on my previous visit with the university orchestra; his name was Fogii. Fogii helped to get me from the airport to the hotel I would be staying at for the duration of my time in Xiamen. 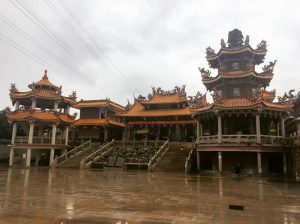 The 7 Days Inn was located just off the main street on Datong Road. Basing myself in the centre of the city, I did find myself to be one of the very few Westerners living in the city which proved to be very entertaining for the locals and continued to be for the entire time I was there; more on that later. 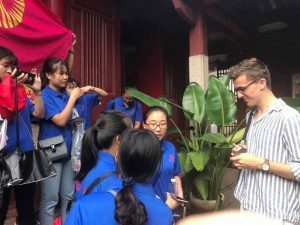 Once I had settled in, I had a week on my own to get comfortable and familiarise myself with the city before the students from America arrived. The course began on Monday 26th June at the Art College. I had first met the Americans the night before for an introductory meal and so I was a little more at ease going in on Monday morning. Out of courtesy we were required to have Chinese names as well as the Chinese students making English names. My Chinese name was Tuōmăsī (托马斯). The main project over the three weeks was to create a one act opera in a bilingual setting. This was split up in to five smaller assignments that were set on the Monday and Wednesday of each week. 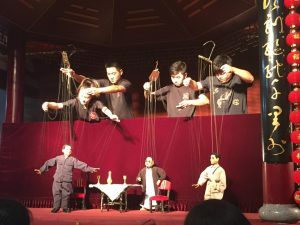 The assignments were to compose an introduction song, create a tableau vivant, create a mash up of at least two folk songs coming from Western and Eastern traditions, compose a song without words using only vowel sounds and to compose a goodbye song. We were also allowed to include anything else that we thought would improve our operas. We were sorted in to four groups with students from both the Art College and Teachers College. 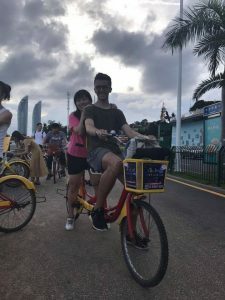 The members of my group were as follows: Fogii (Yijie), Yan (Yan), Chris (Kelisi), Lina (Lina), Carolyn (Chaonan), Gloria (Jia), Zoe (Qianyu) and me. The day of the opera. The opera was a success and the three other groups’ operas were fantastic too. It was a difficult task to complete over three weeks, especially when two different cultures come together to work on something to complex. At the top is my group after our performance. 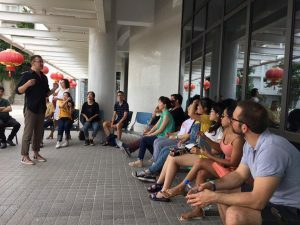 From left to right: Fogii, Yan, Chris, Linda, Carolyn, Gloria, Zoe and I.
Mandarin lessons were also mandatory from Monday to Friday once a day for one and a half hours. These were of paramount importance for our survival in China. Everything we learned was mainly centred on tourism. By the end of the three weeks I was able to count to a thousand, ask for directions, speak to taxi drivers, order food and drink, tell the time and say other useful everyday phrases. 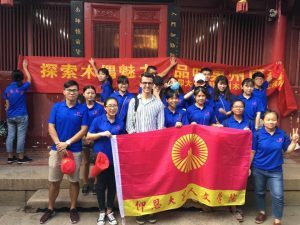 This made our collaboration and communication with the Xiamen students so much easier. 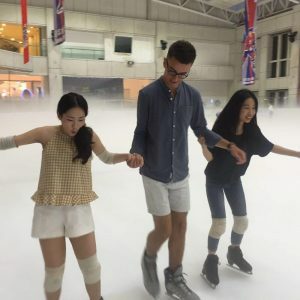 Five weeks was a relatively short time to experience everything Xiamen had to offer and so I made a conscious effort to try new things and step out of my comfort zone. A favourite place of mine to eat was the Zhongshan Road Food Market. It was the perfect place to pop in for a quick bite to eat. It was there I found my taste for barbecued octopus on a stick. I became a regular there as it was only down the road from my hotel and so I ate there whenever I could. I especially made friends with the owner of a shop called Chicken Roads which, by the name, you can tell, specialised in chicken dishes. He would often sit with me when I ate and tell me about where all the dishes he offered originated from in China. 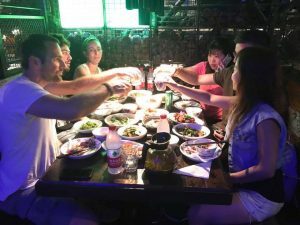 Other new gastronomic experiences I had on the trip were trying things like shark meat, cow tongue, kidney and stomach, crayfish, pig’s trotters, durian and perhaps the most bizarre, fermented duck egg wrapped in duck intestines. Grandma’s Home Restaurant. 18 main dishes, 5 desserts, beer and tea, all for the equivalent of £7. I will admit that as hard as I tried to stick to Chinese food, I couldn’t help but stop by one of the (surprisingly) many McDonald’s in Xiamen for a meal after a particularly heavy night of drinking. Let me stress that this only happened once! 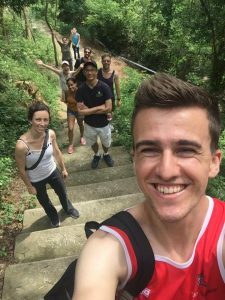 It was interesting to see how the people of Xiamen reacted to a group of foreigners back in February with the staring and the taking of photos, but I can honestly say that this was multiplied by one hundred when I found myself alone in the city. 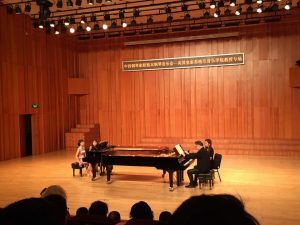 It was one of the most unique experiences I had whilst being in Xiamen. 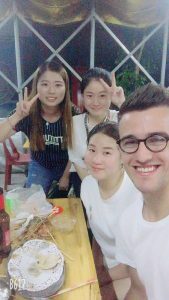 I have included some of the photos I was asked to have with the Xiamen students and some of the strangers I met on the streets. These only make up a tenth of all the times I was asked on the street, in the park, on the beach or even on the bus to have a picture with someone. I am incredibly curious to know where those photos are now and why I was always the one who got picked on. It was probably due to my height as I towered over everyone. 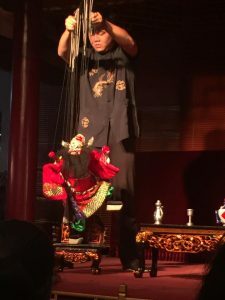 Quanzhou Marionette Troupe. We were told that it is very famous and even the President himself has been to see a show! This was a show about a Chinese prisoner of war captured by the Japanese. The Chinese solder would rather die than share China’s secrets. 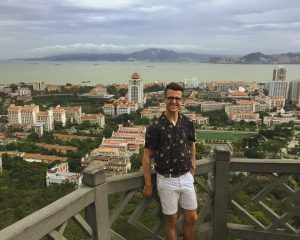 Although there were plenty of other internationals in Xiamen, I always found myself to be the only Westerner in the middle of a sea of Chinese people, all of which stopped and stared as I walked down the street. Things didn’t change even when I was with the Americans. There were twenty other Americans they could have chosen but it was always the tall, awkward one who very clearly didn’t want his photo taken that they chose. I have to say as flattering as all that was, it was a refreshing change to come back to Wales and just be a regular face in the crowd again. 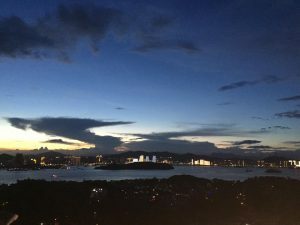 My five week stay in Xiamen will always be one of the most spectacular and special experiences of my life. 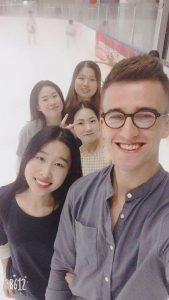 It was a pleasure to get to know and to make many new friends from both sides of the planet and to have been accepted on to this course as a stranger from the UK. 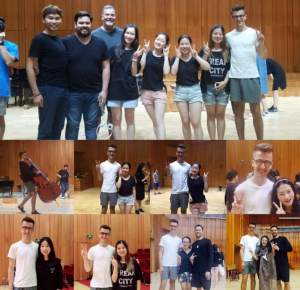 I would like to thank Randall for allowing me to join the course as a complete stranger he had never even heard of until Xiamen University told him a few weeks before the course; and for organising such a fantastic experience for all who participated. I would also like to thank Chao-wei for making the course run as smoothly as it did even with everything the college threw at her like room booking cancellations and instrument hire. I would also like to thank Helen Conway at the School of Music for keeping me sane throughout the whole process before I left for China. Without her help booking a hotel, helping me with my visa and getting me in touch with the Art College, I would have lost my mind and totally given up a long time ago. She was not obliged to help me with all my problems and concerns but she did and made it possible for me to embark on this amazing journey. A bottle of wine and flowers are coming your way, Helen! Finally, I need to thank Global Opportunities for providing me with the financial means to afford this trip to go towards accommodation, flights and money to spend on food to keep me going for a month.